Pupils from the senior stage to act as hosts for visitors from our twin school, Instituto Forti when they visit Motherwell in September. then this is the job for you!!!! 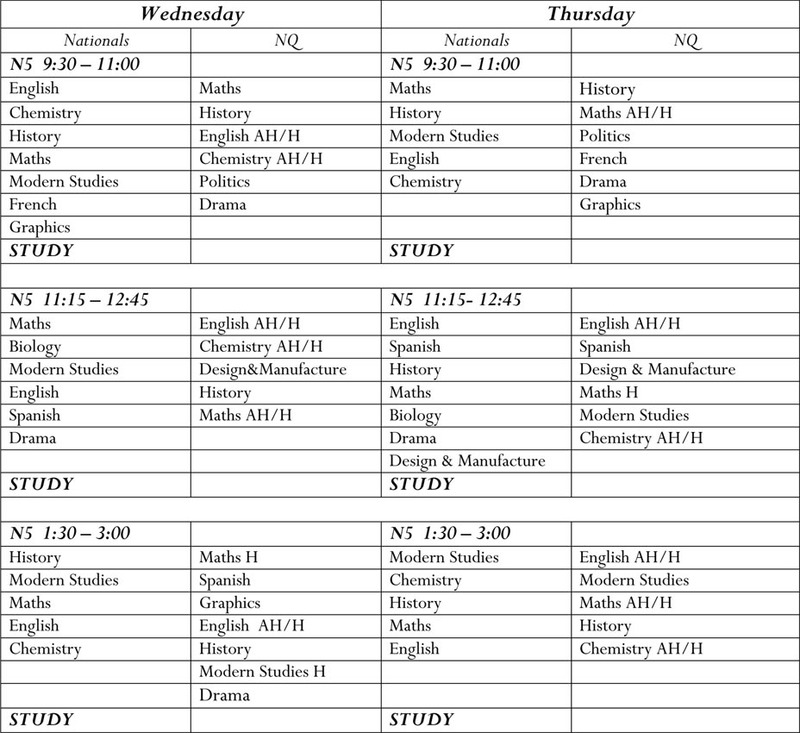 For further information, contact the Modern Languages staff. 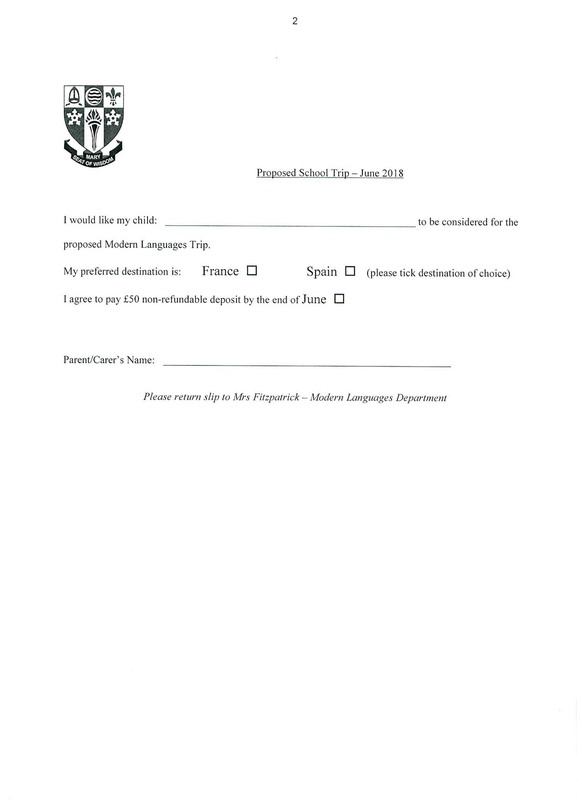 The Modern Languages Department are considering organising a trip to either France or Spain in June 2018 for pupils in S3/S4/S5. 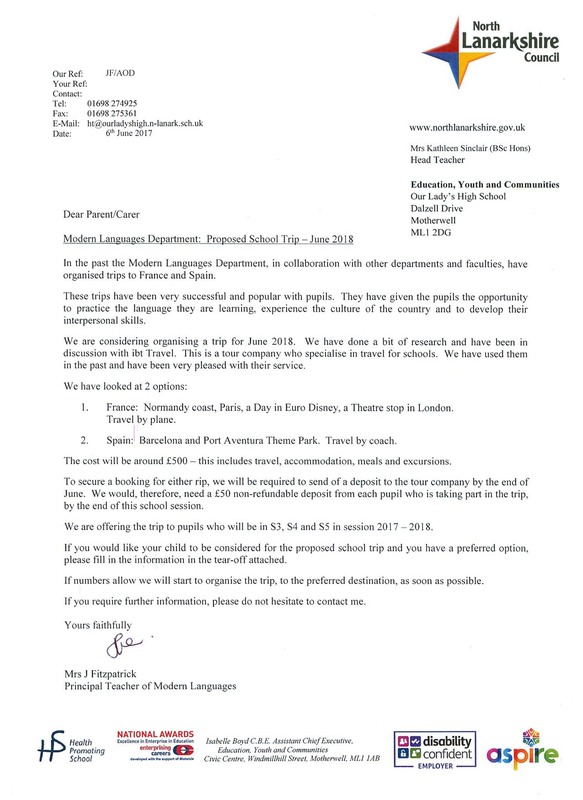 Pupils in those year groups have received the following letter, with a tear off slip. Please return asap if you are interested. You can click on the images to make them larger or click on the PDF version at the bottom. Pupils went exploring today through Google Expeditions, an app that allows classes to visit coral reefs, the Moon, the Grand Canyon, Rio de Janeiro, World War I trenches or the rainforest through Virtual Reality. Over 200 pupils participated from departments including Social Subjects, English, Modern Languages, Science and Nurture. Staff were equally keen to try out the technology for themselves, so there was a steady stream of adults wandering around with the viewers too. On Friday the 25th of November the Social Subjects Faculty will have the privilege of hosting a team from Google Expeditions who facilitated Virtual Reality (VR) learning experiences for a number of our pupils. This unbelievable system allows those taking part to actually experience what it was like to be a soldier in the trenches during the First World War. 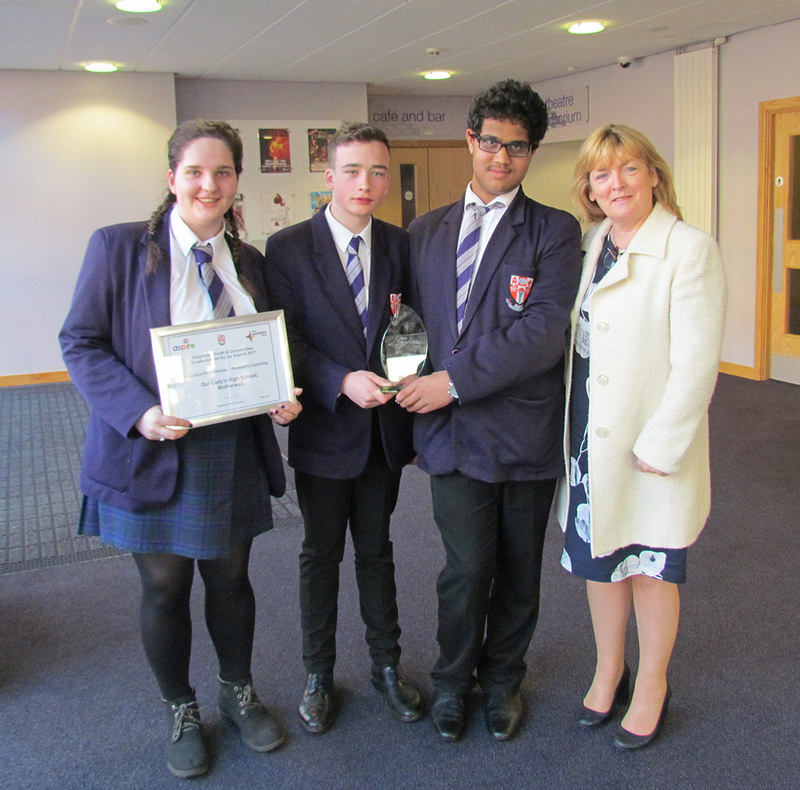 Our Higher French pupils were invited along with other North Lanarkshire schools to the Alliance Française. They enjoyed an immersion morning participating in interactive workshops delivered by native speakers, describing themselves, travelling across the varied regions of France and French culture and music. Pupils found the event fun and very beneficial in boosting their confidence for speaking French. It was interesting for pupils to exchange experiences of preparing for their Higher French in their respective schools.. The penultimate task of our Day of the Dead event was a multiple choice quiz covering Dia de los Muertos and Hallowe’en. The teams had learned about Day of the Dead over the previous weeks through the departments involved. The prizewinners were announced by DHT, Mr McQuillan, before Fr Martin closed the afternoon by reminding everyone that this afternoon had been a way of remembering family and friends who had died. Congratulations to all of S2 whose behaviour was excellent, and thanks to all of the departments involved for another successful Day of the Dead. everyone who helped out the event go ahead: SMT, janitors, admin, all the staff who covered classes, and all the staff who popped in to help. While the cakes were being judged, Mr Pegard introduced our second activity of the afternoon: designing hats for La Calavera Catrina. Pupils had brought in a variety of decorating materials as part of their homework over the past couple of weeks. Day of the Dead 2015 – Cakes! Our Mariachi Band played Mexican classics as pupils arrived and were welcomed to their tables by S6 Caritas pupils. Mr Pégard welcomed pupils to the Día de los Muertos celebrations and Fr Martin Delaney opened with prayers before our first activity which was cake decorating. Each table was provided with bowls full of fairy cakes, decorations, icing, food colourings and squares of fondant icing. Their task was to shape and decorate fondant skulls to sit on top of their cakes with the help of our 6th year helpers. An important part of Day of the Dead celebrations is the altar containing memories dedicated to loved ones. Our altar was filled with skulls created by Art and Design classes and memories of family and friends and well loved famous people created by Religious Education classes as well as a statue of Our Lady. Our Day of the Dead celebrations took place on the afternoon of Friday 6th November, a fabulous interdisciplinary project involving Art and Design, Modern Languages, RE and the Library Resource Centre. Art and Design worked with S2 to create posters and decorations to liven up our Kamwokya Room. The posters showed traditional Day of the Dead skulls on illustrated black paper backgrounds, with more skulls appeared on top of tissue paper, strung together and hung across the room. Finally, we also had some living skeletons as the Caritas class painted their faces as Calavera Catrina, or Elegant Skull. Our 2014 Day of the Dead celebrations have been noted in the SCILT Summer 2015 newsletter, with an article written by our own Mr Pegard. SCILT is Scotland’s national centre for languages. To see the newsletter, Link to SCILT, and click on Summer 2015. In the meantime, please do not hesitate to contact me if you have any questions. Our adventure started in an unfamiliar, foreign land. And no, I’m not talking about Pistoia- I’m talking about the grounds of Dalziel High School. On the 4th of February S6 pupils and one S5 pupil left behind the concrete jungle of Motherwell in search for more sprawling landscapes accompanied by Mrs Fitzpatrick. The trip was part of the annual exhange student trip which has been going on for 13 years. In the September of 2014 Scottish students at Our Lady’s High School welcomed visitors from Pistoia, and finally got to meet their Italian “twins”. Now it was our turn to see how the other half live. After a 3 hour plane journey and a 4 hour bus journey, we arrived at our destination- not that we could see anything, it was pitch black outside. However the Hotel Ville Delle Rose where we would be staying for the next 7 days made up for the lack of visible scenery. The next day we were (kind of) recharged and ready to reunite with our Italian twins. We visited their school like they visited ours and we finally had a chance to ogle at the landscape on the way there. Our Italian twins greeted us and brought us inside. We spent the morning dancing and singing and of course, eating. Later the Italians took us to a shopping centre for a few hours and then to one of the Italian’s houses to hang out. After having the day to mingle with our Italians and settle in, it was time to do some sightseeing. Our first stop? Pisa! When we arrived we had the obviously had the chance to go up the infamous Leaning Tower of Pisa (if you have a phobia of long, windy stairs I don’t recommend) and visit the Cathedral Piazza dei Miracoli and roam around the surrounding area and see what it had to offer. (Yes, I’m talking about food again.) That night we all went to a party hosted by one of our very hospitable Italian’s. On day numero five we made a journey to Viareggio to attend the Carnavale di Viareggio. This was easily one of my favourite days, I have never witnessed anything like it. The point of the Carnavale is to poke fun at politicians and people in power, it is a satirical event. They do this by parading floats throughout the town. There are not only floats, but performers, music, food and a LOT of confetti. (I’m still finding it in my pockets) Whilst in Viareggio most of us also took up the opportunity to buy one of the famous Carnavale masks, as it is tradition. That night we ate dinner in the hotel. We had an early rise the following morning, as that day we were heading to Venice. After the long bus journey and a short boat trip we were free to stretch our legs and roam the peculiar city. We spent the day exploring all the little nooks and crannies and browsing in the rather eccentric shops. Perhaps the highlight of my day in Venice was dinner. Not only was my first carbonara amazing, but it was accompanied by the live music of an accordion player- now that is a true Italian experience! Day eight marked the final leg of our journey. We all knew this day was going to come, but we were just having too much fun to think about it. We met our Italian twins in the lobby after breakfast and not soon after the tears were flowing – and I MEAN flowing (knew I should have brought my water wings). We exchanged gifts and had the chance to take a few photos before heading outside with our luggage. We said our final goodbyes to our Italian friends, but for most of us, we knew it only meant, “Goodbye, for now.” Now it was time to start on our long journey back to reality, but we left Italy on good terms, knowing that we would return. The Italian exchange truly was a life changing experience, a once and a lifetime opportunity that I am so glad I took part in. We got to visit so many beautiful and exciting places, and we made true friends with some amazing people. It was a truly eye opening experience, and I would recommend that any upcoming fifth and six year students sign up, as it is a journey you will never forget. In September we welcomed a group of 20 Italian students, accompanied by their teacher, to OLHS. The Italians love coming to Scotland and are always eager to return the great hospitality that they receive from us. A group of senior pupils accompanied by Mrs Fitzpatrick have just returned from a fabulous week in Provincia of Pistoia in the beautiful region of Tuscany. We took part in a lot of activities which gave us a great insight into the Italian way of life! Our diary was jampacked! We visited our twin school – Instituto Forti – and took part in a variety of lessons including, language, music and theatre. We became seasoned tourists, visiting the beautiful cities of Pisa and Florence. We climbed up the leaning tower and improved our haggling skills in the typical markets. We were really lucky to be in Italy during Carnavale and got to experience two very different carnivals. On Sunday we spent the day in the coastal town of Viarregio and were awestruck by the fabulous floats. These include gigantic papier mache, moving puppets which depict a very satirical view of Italian and international politics. Everything here is good humoured with music and dancing and lots of people in fancy dress. On Monday we visited Venice and were able to get a glance of one of the oldest carnivals in the world. This is an altogether more elegant affair than Viareggio. Lots of people, including actors, local people and tourists stroll around the city dressed in costumes and masks that would be worn to a masked ball. We discovered that some of these costumes are generations old! We also had the chance to be serenaded by gondoliers. On the last night we were treated to a feast of pizza and dancing. Of course, the real highlight of this kind of trip is the fabulous friendships that are forged and deepened with our Italian ‘twins’. Thanks to Jack Divers for the photographs. Click here for the pupil’s-eye view of the trip! The 2014 Modern Languages Christmas Card competition is now on for 1st and 2nd year pupils. If you would like to take part, please come to the Modern Languages Department at lunch time on Thursday. You can also submit a card that you have made at home. Prizes for the best cards. Good Luck!